1969 Pennsylvania INSPECTION Sticker Blue - $25.00 : Bob Hoyts Classic Inspection Stickers, Add a Final Touch to your Restoration! This 1968-69 Inspection sticker was issued very late in 1968 (November) and all thru 1969 expired in one year. This sticker brought to a close this style that had been almost unchanged for ten years. 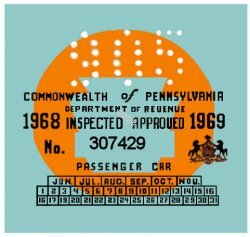 No individual stand alone sticker was issued in 1969 because Pennsylvania was about to introduce a new system in 1970 where they issued a different sticker every three months. This sticker can be custom ordered with your own antique license plate number on front where you see the numbers for an additional $10.